Former President Mahinda Rajapaksa’s eldest son, Namal was arrested today by the FCID over irregular purchase of shares worth Rs. 125 million from HelloCorp. 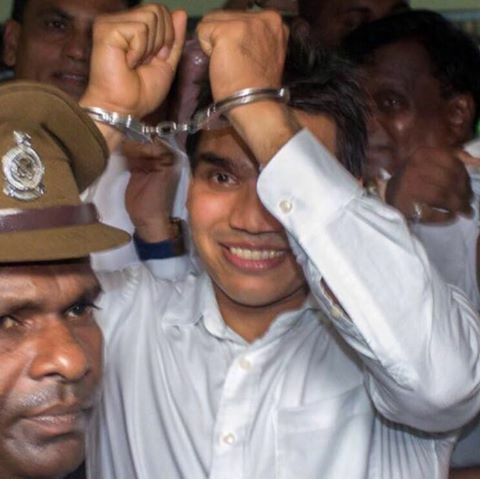 Namal Rajapaksa, who is a Member of Parliament was arrested when he arrived at the FCID to give a statement with regard to the purchase of shares. Before arresting him, the FCID has obtained a statement from Rajapaksa. Rajapaksa, along with several others is alleged to have purchased the shares after securing the funds, which falls under the ‘money laundering’ category. He is currently out on bail over a financial misappropriation case of Rs. 70 million in the Krrish deal.